Mandate Trade Union shop stewards in Dunnes Stores have voted overwhelmingly in favour of commencing a process of balloting for industrial action at the company. The vote took place at a National Shop Stewards Meeting yesterday (Wed 14 January) where workers representing stores from all over Ireland were in attendance. 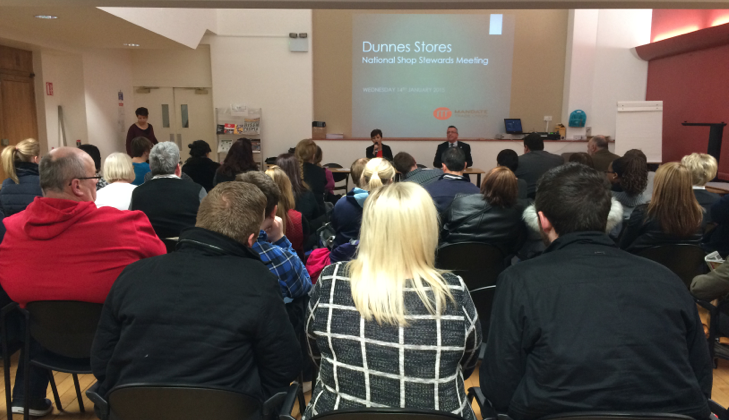 Dunnes employs more than 10,000 workers in 112 stores across the Republic of Ireland. Mandate Trade Union say the balloting process will commence in the coming weeks. Mandate, which represents more than 4,000 workers in Dunnes Stores, say the ballot for industrial action is taking place after the company refused to implement the terms of a Labour Court Recommendation issued in November. One shop steward in attendance said: “We’re extremely disappointed and frustrated that our company has continued to ignore our very reasonable requests. Equally, we’re determined to make real and lasting change in the company and feel we’ve been left with no other option but to ballot for industrial action. Mandate Assistant General Secretary Gerry Light explained some of the key issues raised at the National Shop Steward Meeting. “The combination of low pay and flexible hours means that many Dunnes workers cannot afford to provide a basic standard of living for themselves and their dependents. Many of our members cannot access mortgages or loans because of insecurity of hours due to low-hour contracts. Dunnes workers want to have their right to trade union representation vindicated, particularly when it comes to disciplinary hearings and collective bargaining. Key to all of this this is the fact they don’t feel respected by their employer,” he said. You can join Mandate Trade Union by clicking here. Dunnes Stores workers delivered a Christmas card to Head Office before Christmas.